On Monday 23rd February scores of protestors held a “read-in” at Coventry Council House to protest at the councils proposals to close libraries in the city. 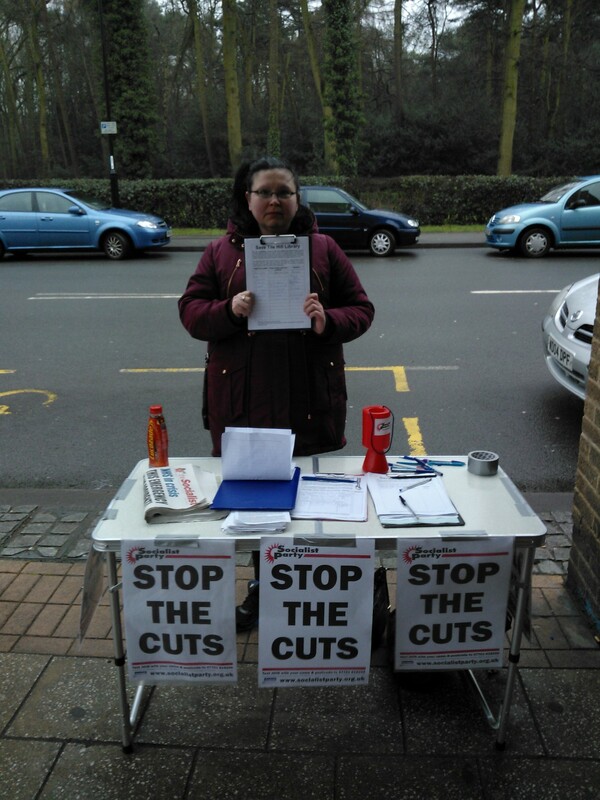 One of them was Sarah Smith from Tile Hill, a Socialist Party member and Trade Unionist and Socialist Coalition (TUSC) activist who campaigned against the closure of Tile Hill Library and has now organised a petition against the closure of Jardine Youth Centre and Tile Hill Children’s Centre. Below are some remarks she wrote about the campaign. “The Library “read in” protest on Monday involved the telling of stories, so here is a story of a girl, who as a child had nothing. This girl got kicked out of school aged 14 without being able to read or write and was branded a good for nothing. This girl used to pass a house often and in that house lived Dave Nellist, this girl heard that this MP stood up for people like her but didn’t ever dare to think that one day she would meet him. That girl was me, and now I campaign alongside Dave! It’s thanks to Libraries and adult education classes that I learned how to read and write and got diagnosed with Dyslexia aged 25. So when I heard of the threatened closures I knew I had to get involved and started the “Save Tile Hill Library” petition, taking it in to every shop on Jardine Crescent. By standing with a stall in Tile Hill, and thanks to the shops support in having the petition, it has gained further support and well over 1000 signatures. Sarah is the prospective TUSC candidate for Woodlands in the May elections. Vote TUSC for fighting local councillors who’ll stand up for you!